First Missanabie Cree First Nation, Ont. team to compete in Little NHL tournament. A bit of history is being made this week at the Little Native Hockey League tournament. That’s because a club from the Missanabie Cree First Nation is taking part for the first time in the 48-year history of the tourney, better known simply as the Little NHL. A record 227 youth squads are participating in this year’s tournament, being held at various rinks throughout Mississauga, a city located just west of Toronto. The Little NHL, which began on Monday and continues until Thursday, has come a long way since its inception when 17 teams took part in the tournament’s inaugural edition. It has become the largest Indigenous hockey tournament in Ontario. As for the Missanabie Cree First Nation, it completed an agreement with the Ontario government for a land transfer of about 39 square kilometres back in 2010. But it was only this past summer that the First Nation received reserve status from the federal government. Though the First Nation has an office in Sault Ste. Marie in northern Ontario, it does not have its own community yet. The First Nation has about 450 members spread out across the country. Last year’s announcement that Missanabie received reserve status got member Dominic Fletcher thinking about entering a team into the Little NHL. He approached Missanabie Chief Jason Gauthier this past November about the idea and was asked to come up with a budget to send a team to the 2019 tournament. “It was almost to the tune of $15,000,” said Fletcher of the costs to outfit a team and pay for their travel and hotel expenses. After presenting his idea and estimated costs to Gauthier, Fletcher received a swift reply. “Without really knowing what to expect, two days later (Gauthier) said we were approved for the budget,” Fletcher said. Things then had to move rather quickly. Tournament rosters for the Little NHL were due in January and Fletcher had to scramble to find some players. Just three players who are Missanabie members were available to suit up for the novice squad. Teams that compete at the Little NHL are allowed to pick up players from other First Nations, however, if their own community is not entering a squad in that division. The tournament operates an online site for players that are seeking a team to play on. As a result, the Missanabie side was able to add eight players, including a backup goalie, to its roster. Fletcher is sharing coaching duties of the Missanabie club with Craig Gideon. A total of 26 squads are participating in the novice recreational category at this year’s tournament. The Missanabie entry had a spectacular debut on Monday during its opening games. In its morning outing, the Missanabie side overcame a 3-0 first-period deficit to edge Whitefish River First Nation 6-5 in overtime. 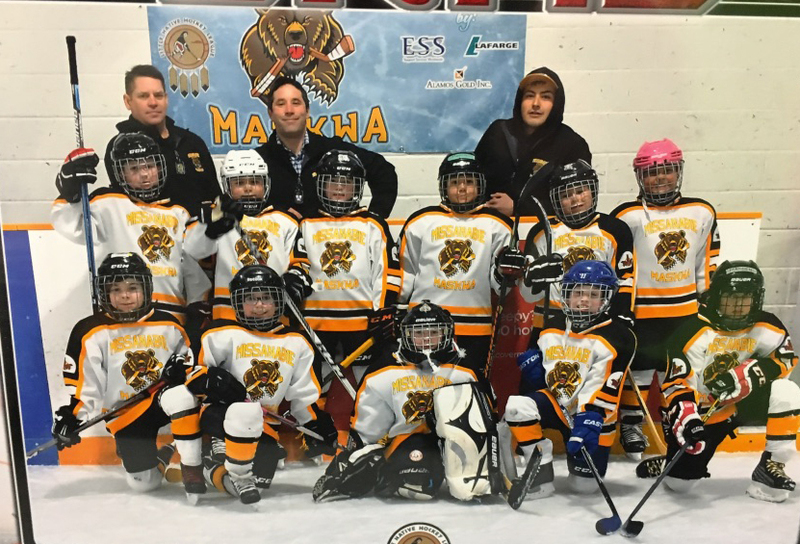 Missanabie also ended up winning its second match on Monday, downing Wasauksing First Nation 7-3 in an afternoon outing. The Missanabie coaches were unwilling to speculate how much more success they could have at this week’s event, preferring to take it one game at a time. Fletcher, however, is already deeming the tournament a success for Missanabie. And he’s already thinking ahead to future events. Fletcher is hoping to have three Missanabie squads participate at the 2020 Little NHL, which will also be held in Mississauga. And he is also keen to see Missanabie clubs enter even more divisions in the tournament in the years after that. The Aamjiwnaang First Nation, located in southwestern Ontario, is the host community for this year’s event even though it is being held in Mississauga. Due to the large number of teams taking part these days the tournament has been held in Mississauga every year since 2013. That’s because the city has enough arenas to accommodate the event and sufficient hotel rooms for participants and their families and supporters.